Sadly no iPhone 5 but the iPhone 4S has been officially announced by Apple. Get a full blow-by-blow account of the event including iPhone 4S release date, specs and features as well as a host of iPhone 4S pictures, white iPod Touch features and the lastest on iOS 5. 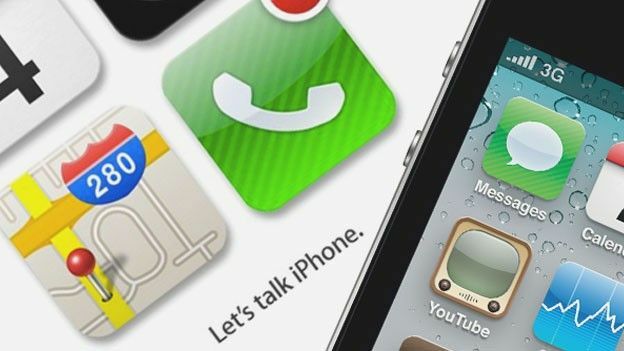 With Apple finally confirming it is to hold an iPhone 5 launch event on Tuesday October 4th, attention now turns to what features the long awaited next-gen handset will land with. Earlier this week the Cupertino-based tach giant sent out invites to the iPhone 5 release date announcement simply teasing “Let's talk iPhone.” Ensuring you are kept fully up to date on all the latest goings on from the iPhone 5 launch, T3 will be on hand with a live blog of the event. Set to land with a bevy of new features, iPhone 5 specs have leaked in patches over the recent weeks and months with the same A5 dual-core processor found within the iPad 2 lining up to make an appearance in the Samsung Galaxy S II and HTC Sensation XE challenger. Other iPhone 5 features to be unveiled at next week's event include a newly slimmed form factor, an 8-megapixel camera with 1080p video recording capabilities and the recently unveiled iOS 5 mobile operating system that will duke it out with Google's upcoming Ice Cream Sandwich OS. As well as the iPhone 5, Apple's launch event is expected to see a host of other goodies enter the realms of reality. Alongside the repeatedly leaked entry level iPhone 4S handset, a new white iPod Touch 3G looks set to be announced. For all the latest live from the iPhone 5 launch event bookmark this page and stay tuned for Tuesday October 4th, 6pm GMT. UPDATE: The excitement seems to have caused the blogging tool to melt down, so we'll be posting on this page for now. Please manually hit refresh for updates. 6:10: Tim Cook is on stage talking about Apple's market share successes. He says the iPhone has 23 per cent of the market, but there's still 77 per cent left to go. People buying handsets other than iPhones isn't acceptible under Cook's reign. 6:16 Earlier in the proceedings, Cook pointed out that that Mac is showing growth across the board. 23 per cent year-on-year growth, compared to just 4 per cent for PC models. 6:20: Cook is championing Apple's programme to send refurbished iPads into the poorest schools in America. 6:22: This launch is actually killing the internet. Liveblogs going down left right and center. Are Apple drones going to ridiculous extents to control the coverage after last year's leak? 6:25: On to apps now. There's now 140,000 iPad apps and Apple has paid out $3 billion to developers. In a very giving mood these days aren't they? 6:26: There's an app called Cards which allows people to create their own greetings cards. There was a bit of applause for that. They're US only. 6:28: T3's Luke Peters on Twitter: "If cards is October 12th, does that mean iOS 5 will be, too?" 6:30: Scott Forstall is on stage now, recapping the key features of iOS 5. Par for the course here. Half an hour in and we barely know anything. Buckle yourselves in guys, it could be a long evening before we get to the main event. 6:30: iMessage? Yep. New Notifications? Yep. Twitter integration? Yep. We know all this stuff guys. C'mon! 6:32: Hey, guess what? You can use the volume button to take photos in iOS 5. 6:34: T3's Luke Peters on Twitter: "2nd tech fashion tweet of the night. Scott Forstall's cardigan with go-faster stripes is fresh." Perhaps the post-Steve is loosening the shackles on Apple employees' dress sense? 6:35: The iPhone 5 launch event is still wreaking havoc for our fellow tech sites. The Liveblogs are dropping like flies. 6:39: We're still hearing about iOS 5 features. iCloud is now being detailed once again. Eddy Cue is on stage now. This fella recently got a big promotion. 6:41: Does anyone else miss Steve Jobs' turtle necks? 6:42: Eddy Cue is talking about iCloud's daily back-up facility. 6:43: Wayhey! 40 minutes into the event, we have the first actual news. Apple will include a Google Latitude alike called Find My Friends, which will allow you to use GPS to track your friends whereabouts. 6:44: You'll be able to see your friends and family on a map if they choose to share their location with you. 6:45: It will also be possible to share your location for a limited time, so if you're roaming around town and want your pals to track you down more easily, you can do so without putting yourself on the map for ever. 6:47: The iCloud platform will go live on the 12th October alongside the iOS 5 launch. That's a week tomorrow. 6:49: Apple's marketing guru Phil Schiller is on stage to talk about iPod. Will we see some new launches? Are they ready to kill the iPod classic forever? 6:50: Refresh and check the top of the page for a gallery from the event. Thanks to Engadget. 6:51: The iPod nano looks like it's staying the same, but it'll now have 16 new watch faces for those who live to wear it on their wrists and there's also an improved fitness experience through Nike+. You can now just go for a run straight out of the box. 6:52: The iPod nano is also getting a price cut. 8GB for $129 and 16GB for $149. It's the most affordable nano ever. 6:53: There's now a white iPod touch. No shocks there 8GB is now $199, 32GB is $299 and 64GB is $399. Out on October 12th. 6:55: New iPod line-up shown. Shuffle, nano, touch. No mention of the iPod classic. Will it still be there when the Apple Store is back up after the event? 6:56: Apple has announced the Apple iPhone 4S. Same on the outside new on the inside, just as we suspected. It has an A5 dual-core processor. 6:57: The iPhone 4S is up to two-times faster than the iPhone 4, with seven-times better graphics. The iPhone 4S will keep the same Retina Display. 6:58: Really doesn't look like we'll see an iPhone 5 today. 6:59: Epic Games showing Infinity Blade 2 on stage. 7:00: In terms of battery life, you'll get 8 hours 3G talktime, 10 hours of video, 40 hours of music. Not exactly blockbusting stuff from this event today, and considering the launch pretty much killed the entire internet, this has to be considered somewhat of a disappointment so far. Can one more thing save the day? 7:03: OK, here's some decent news. Apple is putting two 3G antennas into the iPhone 5 and HSPA+ offering download speeds of up to 14.4Mbps. This was rumoured last week. Phil Schiller says its "essentially what its rivals have been calling 4G." It'll be twice as fast as the iPhone 4. 7:06: Another couple of rumours confirmed here. The iPhone 4S will be a world phone, meaning it'll work on GSM and CDMA networks. Doesn't mean so much for us in the UK however as we're GSM-only. 7:07: The iPhone 4S will have an 8-megapixel camera sensor, as expected. 7:08: The iPhone 4S camera sensor offers 60 per cent more pixels than the iPhone 4 and the sensor allows 73 per cent more light in, which should make for better pictures. It's also got face detection and better while balance controls. 7:09: It only takes 1.1 seconds to take the first picture and then half a second to follow it up with the second snap. 7:10: The pictures being shown on the screen look absolutely incredible. Will be great to see these in action. 7:11: The iPhone 4S will have 1080p full HD video recording. That's pretty much as many improvements as they can possible fit into the camera. 7:12: Phil Schiller says that to many iPhone 4S customers, the device will be the best stills camera and best video camera, they have ever owned. 7:13: Reuters is reporting that Apple shares have slumped 4 per cent following the launch of the iPhone 4S. Not gone over that well with investors then? 7:14: It's "entirely new" on the inside says Phil Schiller, but will that be enough to entice those looking for something new? 7:15: It's Assistant time. The heavily-touted "system-wide voice navigational tool." is real. Schiller is saying that you'll be able to ask your iPhone 4S a question and it will reply to you. 7:20: The voice control feature is called Siri. 7:22: When a new message comes through. press down the home button and say "Read my message." You can then dictate replies. You can ask Siri about the weather, ask it to find restaurants, make appointments. It's pretty much your personal assistant. It looks amazing. Let's hope it works better for us Brits than Google's voice search does. 7:24: If you ask Siri "what the weather will be like today," it will reply with "Here is the weather for today." 7:25: T3's Luke Peters on Twitter for @T3dotcom - "iPhone 4S: 1080p video recording has just put final nail in coffin for the camcorder industry." 7:26: T3's Luke Peters on Twitter for @T3dotcom - "If Siri DOES work, it could mean an end to all human relationships as we know it. My wife is going to hate this." 7:27: You can also ask Siri questions like "How many days are there until Christmas." In case you are wondering, it's 82 days. Better get shopping. 7:28: Other Siri highlights: You can ask questions like "How do I get home?" and you can tell it to "Wake me up at 6am" and it wil set the alarm for you. Ask "Who is Siri" and it will say "I'm a humble personal assistant." 7:29: T3's Luke Peters on Twitter for @T3dotcom - "Both Orange and T-Mobile will be selling the iPhone 4S from launch date. I'll tell you when that might be in a sec..."
7:31: Apple is now showing a video showcasing the features of the new iPhone 4S. Is that it for the announcements? Will there be one more thing? 7:32: As we take a slight breather, here's the top line. There is no Apple iPhone 5. The iPhone 4S is the new model and it looks exactly the same as the iPhone 4. The differences? The same A5 processor as the iPad, 7x better graphics than the iPhone 4, an 8-megapixel camer with 1080p HD video recording. There's also a new voice control feature called "Siri"
7:35: A bit of love for T3 from the Gadget Show's Pollyanna Woodward on Twitter: "Have to say a HUGE thank you to @t3dotcom for keeping me up to date with apple news, even though im in the gym, I havent missed anything." 7:37: The iPhone 4S will be available in 70 countries by the end of the year. The UK and the main territories will get it on the 14th October. Pre-orders begin this Friday on the 7th. 7:38: The iPhone 3GS continues to live on! It'll be free on contact. The iPhone 4 8GB will be available in the US from $99 on contract. That's half the premium users were paying prior to today. 7:40: There's a 64GB iPhone 4S. In the US, it'll be a whopping $400 on a two year contact. We'll have UK pricing information as soon as it's released. Three mobile just called us to say they'll be stocking it from launch day. 7:41: Tim Cook is back on stage summing up all of the new features. He says: "I am so incredibly proud of this company and all of the teams who work so hard to bring all of the innovations you've seen today." 7:42: And that's it. The event is over. No iPhone 5 and no "One more thing." 7:43: T3's Luke Peters a few minutes ago from the iPhone launch event in Covent Garden, London. "I really don't think we're going to be seeing an iPhone 5 here today. I can hear the disappointment from here. Siri looks masterful, though" He was right. Is disappointment the overriding emotion you're feeling after that launch? 7:45: For our US readers, the iPhone 4S will be the first iPhone to launch on the Sprint network. 7:48: Will you be pre-ordering the iPhone 4S on October 7th? Will a price cut to the iPhone tempt you to go for the second tier model? 7:49: Again, we're awaiting any news on UK pricing. The Apple Store is still down. 7:50: Another great piece of news, that we kinda glossed over during the event, is the presence of dual antennas on the device. They'll enable 14.4Mbps internet speeds and hopefully put an end to some of the signal-loss issues that caused huge controversy when the iPhone 4 launched. If you like to get about a bit, the iPhone 4S' world phone status will also be great. 7:54: In case you missed it, the iPod nano also got a slight makeover at today's launch. Check out our iPod nano features and price revealed round-up. 7:57: Apple also announced a stunning white iPod touch. Aside form the slightly lighter hue, there's not much else to see here. Same screen, same size, same cameras. 8:00: And finally, the launch of iOS 5 for existing device owners will come a week tomorrow, on Wednesday 12th October. Two days before the iPhone 4S arrives.